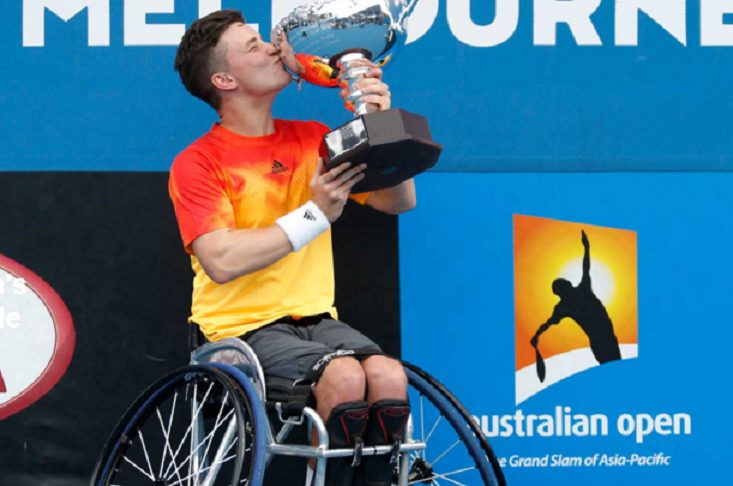 Congratulations to Gordon Reid on winning his first Men’s Singles Grand Slam title when he defeated Joachim Gerard of Belgium 7-6 (9-7) 6-4 to claim the Australian Open. Gordon who was supported throughout the tournament by family and friends, told the BBC that “he would be buying them drinks all night” to celebrate his achievement. Gordon certainly didn’t have an easy draw on his way to winning the title. He had to knock out the World Number 1 Shingo Kunieda of Japan in his first match. Kunieda, who later partnered Gordon in the Doubles, had won eight out of the nine previous Australian Open titles, having never lost a singles match since 2007. Gordon has been a Heroes Centre Ambassador since the project was launched in 2013.